At Aegis, We take the Flu season very seriously, and the storage and control of your vaccine is our main concern. We know that mismanaged and improper storage of vaccine is a major problem faced by every clinician. Accurate and uniform Temperature distribution in your refrigerator is key to the life and quality of your vaccine. The variances in temperature of a household or dorm type refrigerator can compromise your vaccines and cost you thousands of dollars in lost precious vaccine. Temperatures for Vaccine need to be maintained within range of strict standards. Refrigerated vaccines require between 2° and 8° C.
Vaccines for H1N1 influenza have a tight requirement of 2° – 8° C with a desired average of 5° C and must have the temperature measured twice a day. Aegis has taken an aggressive role in providing Doctors office, Clinics, Hospitals, and Departments of Health with “Real Solutions” in the Storage and Temperature Monitoring of vaccines. We have developed programs that satisfy a Single Doctor with the need for a vaccine storage refrigerator with the ability to continually monitor the unit from any computer with an internet connection and be notified of out of range temperatures by email, smartphone, smart pad, or phone call. All of these features at very affordable prices. (Please contact us for individual Dr. References). We have also installed as many as 1000 temperature sensors individual hospitals to monitor temperature, humidity, CO2, power, and many other environmental conditions. 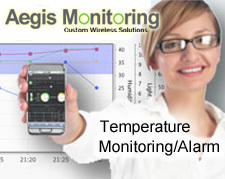 Please contact Aegis for additional information or to arrange a demo of our monitoring system or to get a quote.